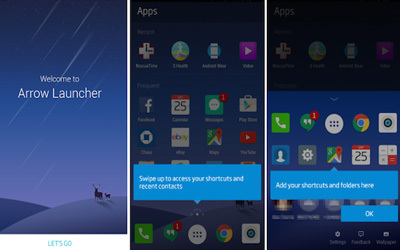 Previous version Microsoft Arrow Launcher 3.2.0.31695 apk for Android will help you to downgrade or install older app easily. This is one of the best Personalization apps. The second page is the place for the main home page. The main home page is contained applications which are you already installed on your gadget. The home page will be also divided into two scenes. The first one is Recent, which will show you the most recently installed application on your phone. And the second one is Frequent Scene, which contains all applications you frequently used. The third page (which is also the final page) is the place for Reminder stuff and Notes. It will help you with the schedule tasks and other reminders. But to activate the reminders, you should enter them manually. And for your information, Microsoft Arrow Launcher for android is not related with Google Now and other applications as the third-party. Actually there are more about this launcher of course with the benefits and the drawbacks. But if you like the clean and neat interface on your phone, it is highly recommended to use it for android. But due to it does not relate with even Google Play, you should send an invite request via Google+ Community before you are able to download it from the Google Play directly. But if it is too complicated, you can find the APK file to use this launcher. Recent section to the All Apps page. Number of recent contacts from 1 to 3 on the People page. Amazing launcher, smooth and clean and works like a charm. Need a few days to get used to it but works better than the nasty Samsung launcher!